How true it is. 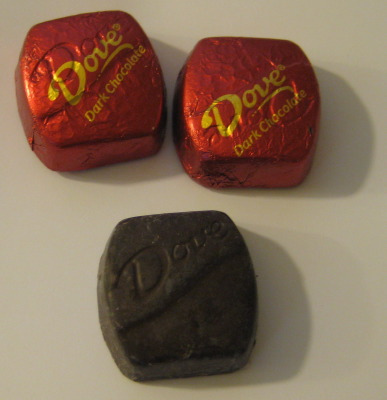 That’s what the foil wrapper of my dark chocolate Dove Promise said today. Genius, isn’t it? My husband has often said happiness needs to come from within; it can’t come from someone or something else. He should know — he’s one of the happiest people I know and he grew up in a third-world country under some very difficult circumstances and still came out with an amazing, realistic but optimistic attitude toward life. In fact, it’s one of the things I admire most about him. Yet all too often we want someone or something else to be the source of our happiness … we want to blame someone or something external for our lack of happiness or our failure to be content with what we have … when in reality, it’s ours to be had. Ultimately, it lies within us — if we’re willing to listen. It really is an “inside job.” And it’s something of which I needed to be reminded. After a super-stressful morning that started with losing six days’ worth of data I needed for a bi-weekly report for one client — coupled with a few snafus related to a big photo shoot for another client — it was exactly what I needed to read. I’d have saved the wrapper for safe-guarding but I licked it clean 😉 What is it about women and dark chocolate?! Seriously, two of those little guys curbed my sweet tooth for just two Points. No need to buy sub-par chocolate I’d only take a bite out of. Anyway, after reading that message, I felt calm and collected in a client meeting and was able to enjoy my evening at home tonight, letting the stress of the day brush off my back where it belongs, instead of taking it home with me. In addition, I’ve been enjoying this week away from the gym/formal exercise, though I’m thinking tomorrow might be a good day to get back at it (my last workout was last Thurs.). For the moment, I’m just listening to my body, which seems to be telling me to just let it be. How about you? How do you view happiness? Is it on a continuum? Something that ebbs and flows? Do you rely on others for your happiness? Next postScary Sunday & Happy Mama’s Day! Great post, Melissa. And, you are MOST welcome! I love those little bits of chocolate coupled with inspiration. I think I’ve learned just in the past couple of years that happiness is, for me anyway, a choice I make every.single.day. And, I do believe that its within us to make that choice and to be satisfied with it, no matter what life brings. There are so many sucky situations going on around me right now. It breaks my heart. However, I have not only my faith but also my happiness to remind me that this is just a season and better days are ahead. Thanks for reminding me again! I have come to view happiness as a choice, completely within my control. Wow, sometimes chocolate gets it right, who knew? Wow. I totally needed this today, who knew such inspiration could come from something so tasty – love me some dove dark chocolate!! Seriously, though – it’s true, happiness is truly a choice (my husband is a big believer in this and reminds me of it often). It’s just so easy to fall into the negativity trap that the “happiness is a choice” mantra can be hard to revert to sometimes. Totally not an excuse though, and I’ve actually been working very hard to shake those negative vibes off quicker than I may have been able to in the past. Thanks for this post today!